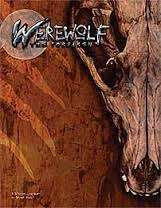 This introductory package contains everything you and a small group of friends will need to play your first game of Werewolf: The Forsaken, except for some pencils and paper (for notes) and several 10-sided dice. (These specialty dice are available in most hobby shops and are sometimes called "d10s.") Those of you who are going to be players should read over the character backgrounds at the end of this package and choose the one you want to play. The Storyteller should read the rest of the booklet in preparation before playing. Does this have all five parts of the Manitou Springs Chronicle? This title was added to our catalog on May 25, 2005.